The honor is considered the most prestigious undergraduate scholarship in the natural sciences, mathematics and engineering in America. This year, 1,286 students were nominated from 470 institutions. Of the nominees, 240 were named Goldwater Scholars and 307 were chosen as honorable mentions. Three of UW–Madison’s four nominations were accepted for the award; the fourth was named an honorable mention. Cory J. Cotter, a junior from Pulaski, Wisconsin, majoring in astronomy-physics, computer sciences, mathematics and physics. His research interests have included work on galactic wind models. He plans to pursue a doctorate in astronomy. Emily Jewell, a senior double majoring in engineering mechanics and mathematics from Apple Valley, Minnesota. Her research includes a “novel analysis method for understanding contact and damping of modeled bolted joints.” She plans to pursue a doctorate in aerospace engineering. Lucas (Luke) J. Oxtoby, a junior majoring in chemistry from Howards Grove, Wisconsin. After completing a doctorate in chemistry, he hopes to teach and conduct research in the field of synthetic chemistry as a professor. Junior Elizabeth (Elise) R. Penn from Milwaukee, Wisconsin, received an honorable mention. She is majoring in geological engineering, geology and geophysics, and mathematics. Goldwater Scholars from UW–Madison have historically received other prestigious awards later on in their academic careers. 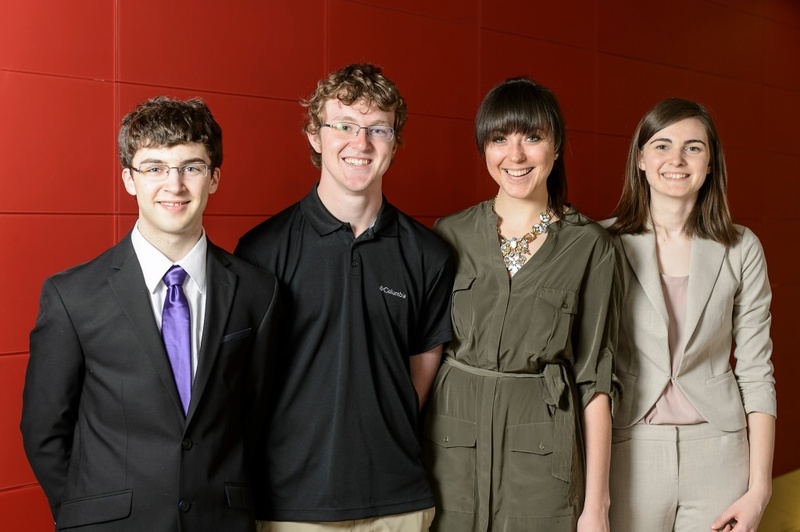 2015 Goldwater Scholar Bill Mulligan was a finalist for both the Rhodes and Marshall scholarships, 2013 Goldwater Scholar Drew Birrenkott received a Rhodes Scholarship, and Joshua Shutter, a fellow 2013 Scholar, received a Churchill Scholarship. Congress established the Barry Goldwater Scholarship & Excellence in Education Foundation in 1986. Goldwater, the award’s namesake, served in the U.S. Senate for more than 30 years and challenged Lyndon B. Johnson for the presidency in 1964. The foundation aims to develop highly qualified scientists, engineers and mathematicians through its scholarship award.